Grass seeds may not seem to have much affect on dogs until your dog comes into contact with them. Grass seeds can be easily picked up by dogs and can cause serious damage if not treated quickly and properly. Treatment for a grass seed infection can be simple or complex, depending on the time elapsed and the number of seeds involved. Prevention is the best method of dealing with the affect of grass seeds on your dog. There are several signs of grass seeds present in dogs. There are both visible and unseen signs. The common visible signs include grass seed in fur, ear, eye, nose and skin. Matted fur may be the only visible sign of grass seed in fur. Grass seeds in the ear may cause the dog to shake the head, scratch the ear, rub its head on the floor or walk with its head tilted. Inflamed or red eyes can be a sign of grass seeds in the eye or eyelid. A dog with grass seeds in the nasal passage may sneeze, show discharge from the passageway or paw at its nose. Chewing at the skin may be a sign of a grass seed embedded in the skin. Coughing or vomiting after walking through tall grass may be a sign of the dog swallowing grass seed. Internal signs may include inflammation, swelling, vomiting and difficulty breathing. Fever may occur and the dog may refuse to eat. Problems related to grass seeds present in dogs can be serious. Ulcers in the cornea and vision loss can occur. Abscesses in the lung or spinal problems may also occur if the seeds travel into internal organs. Ear infections and hearing loss can occur from seeds entering the ear. Grass seeds can enter a dog's body through various means. Seeds can be picked up by the dog walking through tall grass, picking up grass seeds in the fur around the paws or underbelly, and from eating grass with seed heads. Grass seeds can be dart-shaped with long tails, allowing them to easily enter under the skin; once the seed enters the skin it can quickly travel, causing irritation. Treatment should be done as quickly as possible. If the tail end of the grass seed can be found sticking out of the skin, tweezers can be used to remove the seed. Seeds that have gone too deep into the skin for easy removal will need to be removed by a veterinarian. If the pet owner is not present when the dog first comes into contact with the seed, the pet owner may not realize there is a problem with a seed. Veterinarians can check for grass seeds if they are informed about the dog and where the dog was within the previous days. Multiple incisions may be required to find the actual seed or seeds. The dog will be under general anesthesia and will need a few days to recover. Keeping the dog out of high grass is the best prevention. 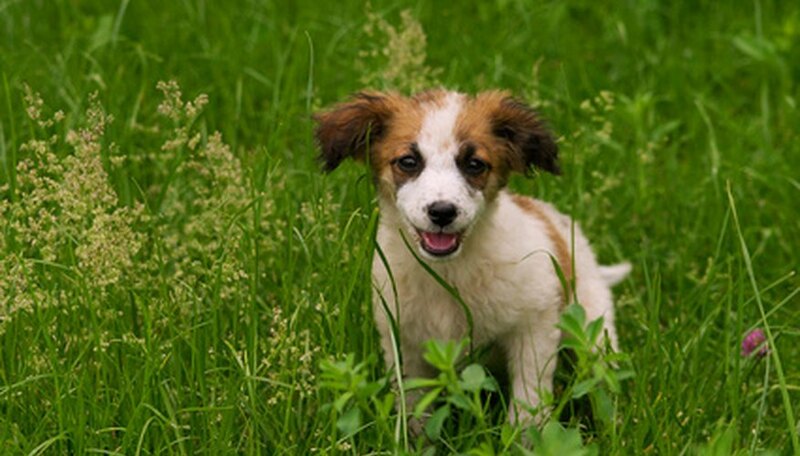 Grass that is going to seed should also be avoided so that the seeds do not come into contact with your dog. In situations where this may not be possible, protective vests to cover the chest and abdomen can be purchased for your dog. Long-haired dogs which are outdoors for many hours should have their fur clipped during the autumn when grass is going to seed. If you travel or work with your dog in fields, brush down the coat immediately upon returning home. Check and clean out between the toes, ears, groin and where the legs meet the body.